"Good Morning! This ain't Vietnam/ Still, people lose hands, legs, arms for real/ Little was known of Sierra Leone, and how it connect to the diamonds we own..."
-- Kanye West, "Diamonds from Sierra Leone"
These lyrics may be part of a popular song, but they paint an all too realistic picture of the deadly blood diamond trade that persists in West Africa. During Sierra Leone's decade-long civil war, rebel forces and warlords funded their actions with billion-dollar profits from the diamond trade. But even though the war has ended, this cruel and violent byproduct has not. 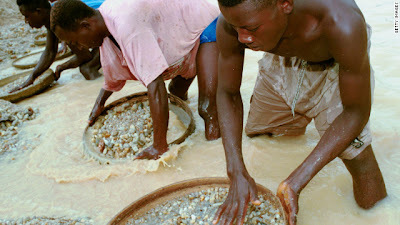 Men, women, and children are still used practically as slaves to extract diamonds. Many get paid less than US$1 a day and endure work without shoes, gloves, hard hats or proper tools. The back-breaking work of diamond extraction. To escape these conditions and generate revenue in a safe, secure manner, entrepreneurs in Sierra Leone have increasingly looked to microfinance as a way to obtain capital and start their own businesses. One entrepreneur in particular, Yenku Sesay, has defied the odds to become a successful businessman. In 1998, a the Rebel United Front (RUF) invaded his village and cut off people's hands as punishment for voting for the opposition -- including Yenku's. It took him three days to receive treatment. Afterward -- unable to work -- he had to rely on begging to survive. His luck changed in 2006 when he was approached by Kiva Field Partner Salone Microfinance Trust (SMT). As a double amputee, he was unable to receive a traditional loan. But with SMT's help and Kiva lenders' risk-tolerant capital, he was able to take out a US$100 loan and build a retail business. Repaying every loan on time, he was able to take out more and more to grow his inventory and expand into agriculture. With his profits, he now leads a life that he couldn't have expected a decade ago, sending his young children to school, and even paying for his younger brother's education. Yenku at his retail stand. 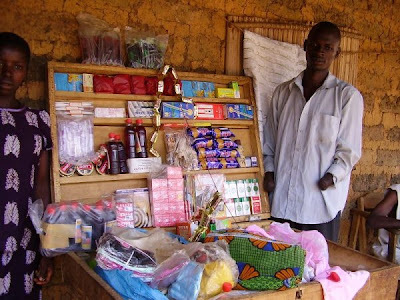 For women in Sierra Leone, microfinance is a powerful tool to spark self-employment and independence. 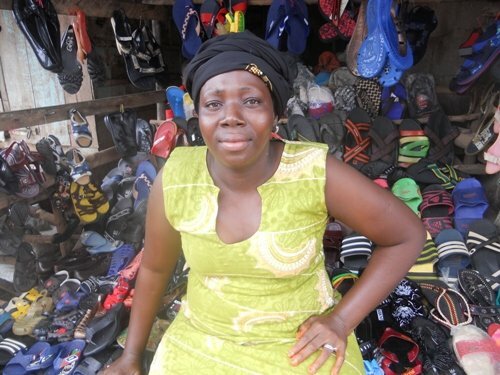 Borrower Aminata is married with two children, ages four and nine. Since 1999, she has worked 7 days a week and 10 hours a day to sustain her plastic products business. She sells slippers and sandals, and the business has been able to help her and her husband run their home and be self-sustainable. She has already repaid two loans and is looking for another to expand her business even more. Aminata in front of her store. The success of the entrepreneurs above would not be possible without funding from lenders. Kiva Fellows have the unique opportunity to build relationships with borrowers like Aminata and Yenku and communicate their needs to the lending community. 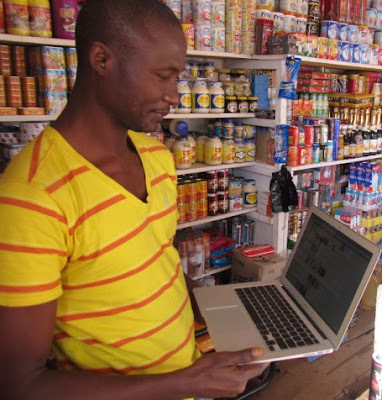 In this special case, Kiva Fellows based in Makeni, Sierra Leone -- David McNeill and Eric Rindal -- were able to show borrower Muhammad his profile on Kiva and the 38 lenders who financed his loan. Muhammad could hardly believe that people around the world had pitched in to support his business. Muhammad seeing his Kiva profile for the first time. At that moment we saw the beauty in Kiva. The Kiva process came full circle. Muhammad had touched lenders’ hearts and in turn his heart was touched. Our “face” is so important in the Kiva process. It represents who we are and what we do… this model may bring people closer than we can imagine. Stories like these make all of us here at Kiva proud to support the borrowers and staff of our local Field Partners as we work together to change the world's financial landscape and build a brighter future for Sierra Leone. This is the final post of a three-part series taking a deep-dive look at Sierra Leone, its history with microfinance, Kiva's role in expanding opportunities for the Sierra Leone population, and what it's like to participate in the country's economy as a borrower, lender and field worker.